While I won't delve into the relative merits and drawbacks of Star Touch, one of the characteristics of its layout is that it allows, arguably encourages, the use of photos and interactive content. This creates new opportunities for the type of material that can be presented. I was asked to provide a regular Do It Yourself type feature for Wheels based on my experience as a full-time working mechanic and lifelong gearhead. The result was "DIY Garage". In my head, DIY Garage was intended to fill two primary roles; a general "how-to" on some basic car maintenance tasks, and providing the sort of information that might result from someone chatting up their car-savvy friend or neighbour. There were, of course, limitations to just how in-depth I could get with the constraints of both the format of the features (which eventually settled on a brief introduction and generally 4-6 captioned photos) and the bounds of just what sort of stuff your average DIY'er would likely tackle in an average residential garage or driveway. Video had been discussed, and I did in fact create two (oil changes and spare tire basics), however it was quickly determined that adding video content to Star Touch rapidly ballooned edition downloads to unrealistic sizes, so DIY Garage stayed strictly text and photos, which was fine by me. With my skillset and equipment, filming and editing videos is a ton of work and takes forever. I did send in actual photos of my considerably less photogenic two-car residential garage after seeing this background in my first piece; strangely, those pictures were never used. This is clearly some European (guessing German...) commercial workshop space that came from the internet. Doesn't really say "DIY" to me. More like "OCD". Still, it does look nice. With the Star deciding to no longer use freelance-supplied content for Wheels as of mid-May of 2016, DIY Garage's days were numbered. A total of 15 appeared in the Star Touch editions of Wheels, while 7 seem to have made the leap to the Star's broader online edition. I'll be supplying links and commentary to each of those in some future Loose Nut updates. I won't lie - it was becoming increasingly difficult to find topics that were realistic, interesting, and importantly, didn't require me to just buy parts for the sake of changing them. I actually did that for the spark plug story seen here, as none of my family's vehicles were due for them. Four plugs are one thing; I wasn't about to hang new brakes to accomplish the same goal. Thankfully, my employer is very supportive of my writing, so I was able to photo-document a few jobs at work that would fall into the realm of DIY-plausible. Window Regulator Replacement was one of those. Doubtless I could have found a number of additional stories there. It's a pity that things went the way that they did. I have provided technical content for a trade publication called CarCare Business, however those are aimed at technicians, so they're typically jargon dense and not well suited for a layman audience. There's something enjoyable about sharing knowledge and passion with people that are simply interested in it. Hopefully I'll have another chance to do something like this for a major outlet in the future. More on DIY Garage to follow. Thanks for reading. See you soon! It's true that I have a fondness for Mazdas, but it's just as true that I'll call a spade a spade. This is no spade. It's a diamond. Sure, there are some glaring omissions. While heated seats both front and rear are standard, a heated steering wheel isn't available. 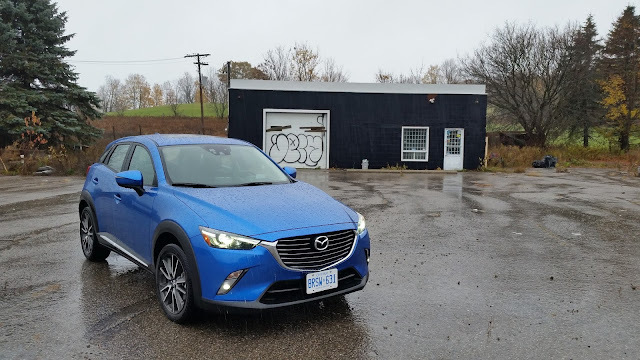 This is Canada, Mazda. I can get a heated steering wheel in a Kia Forte. Optional engine? Nope. No such luck. You can, however, get a manual gearbox in all three of the 6's trim levels, even if the top GT model's advanced safety and adaptive cruise package is automatic only. If my previous experience is any indication, the manual box would be a joy to use. How it is that this nicely made, stylish, well-equipped, and fun to drive car gets continuously overlooked in this segment baffles me. Then again, plenty of people bought the previous generation Chrysler 200 and Dodge Avenger. Maybe midsize sedan buyers just prefer shoddy build quality and crappy dynamics. ...because this is where it gets really weird. Yep. It's a trike! 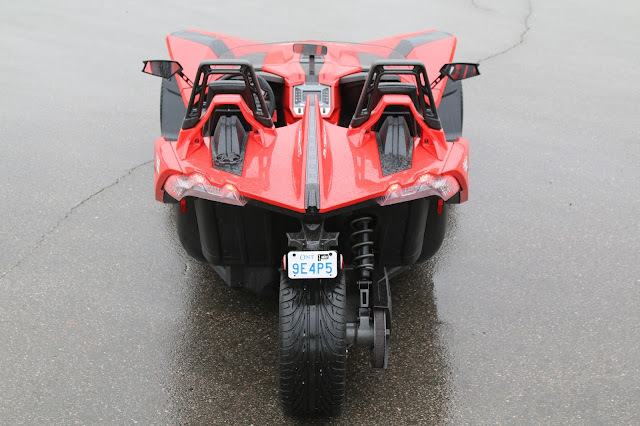 You can read my Wheels review of Polaris' unusual Slingshot roadster trike here. 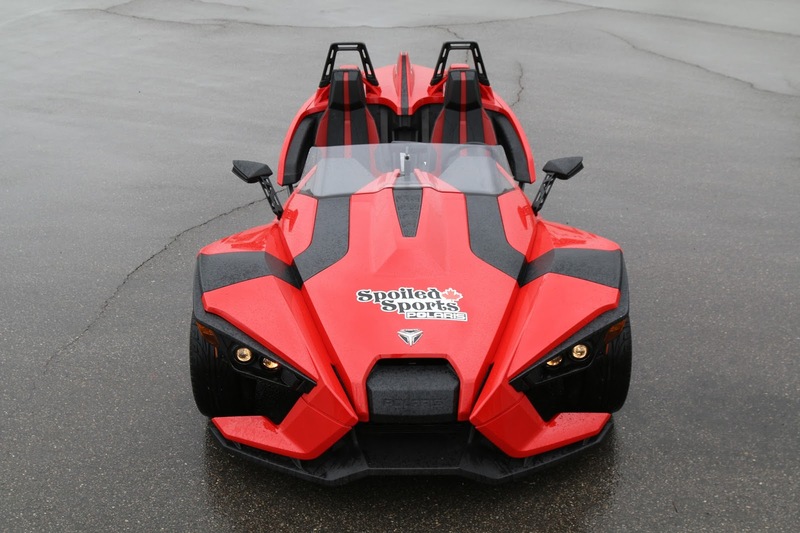 Many thanks to Dave Todd, owner of Spoiled Sports in Bowmanville, Ontario, for providing the test vehicle. Make no mistake, this thing is unconventional. Particularly now, as this vehicle configuration has not been available in Ontario, the level of attention it garners is astounding. It is simultaneously a blast to drive and tiring - both driver and passenger have to wear a motorcycle helmet (and a full-face type helmet is a very good idea given the low height and lack of a real windshield) - and there's a lot of noise from the belt-drive transfer unit and snowmobile-style exhaust. You have to rethink the car strategy of straddling potholes and bumps, as the central rear wheel will encounter what the front wheels miss, and it doesn't always enjoy it. While the Slingshot actually is pretty quick, and it handles better than the odd number of tires would suggest possible, this is more of a cruising and socializing vehicle than a three-day, Tail of the Dragon road-tripper. It would do it, no problem. Whether you'd want to is the question. Just recognize it for the fun, attention-getting toy that it is and enjoy the sunshine. Through your visor. Hard to believe, but after over 13 years of proudly providing content for the Toronto Star's Wheels section, this review was my last. 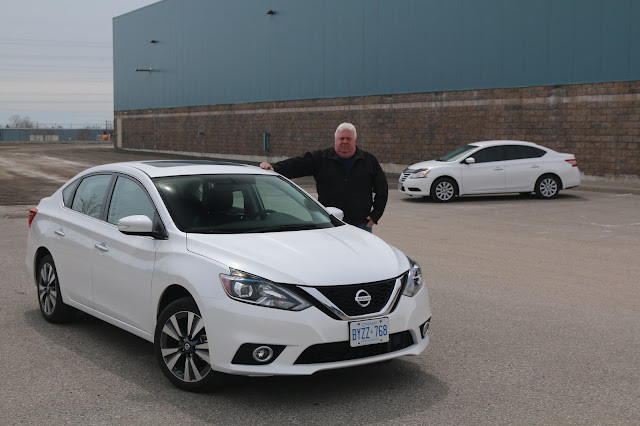 My take on Nissan's refreshed for 2016 Sentra can be found here. I'm a Nissan fan, having not only owned seven of them over the years, but having had one or another as a daily driver since I was a teenager, longer ago than I care to think about. Unfortunately, as happens with every automaker, some models are better than others. Nissan has struck out with this one as far as I'm concerned; I wouldn't own this generation of Sentra, certainly not one with the available CVT, anyway. 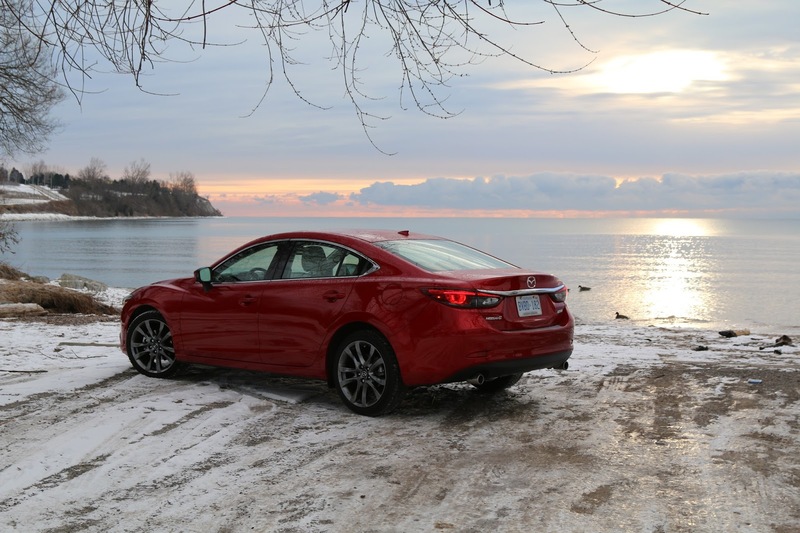 A recent Car and Driver 5-way comparo summed up the dead-last ranked, CVT-equipped Sentra thusly: "Faster than walking, shelters you from the elements." Nissan needs to either start using the Brazillian market Sentra's 2.0 litre engine here, or plunk in a version of the Juke's 1.6 turbo, because the current 1.8 is simply under-equipped to motivate this car with anything approaching enthusiasm. While they're at it, they ought to pull the engineers that designed and tuned the early 90's era Sentra SE-R and NX2000's "B13" chassis out of retirement and get them to do an emergency rework of this one - this Sentra has both zero verve and unimpressive ride quality. Bizarre, because the basic ingredients are good: it's roomy, it offers the latest safety tech, it's well-equipped for the money, and (in the right hands) it can return good mileage. The recipe just needs some serious tweaking. Stay tuned! While this is the last of my Toronto Star Wheels reviews, there is more Star content for me to share. See you soon. 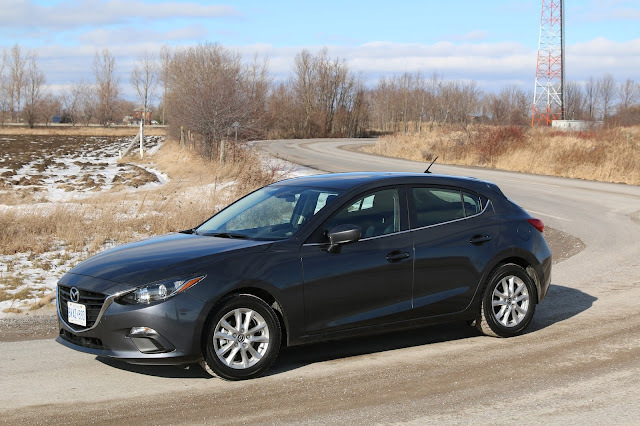 You can find my Wheels review of Mazda's compact 3 Sport hatchback in GS trim here. Production of some Mazda 3 models switched to the company's brand new facility in Salamanca, Mexico recently. Would there be a noticeable difference in build quality relative to the Japanese-sourced models available previously? As it turns out, at least in the short term, no. The 2.0/manual Sport might be the best all-around configuration of this vehicle, though I'd be hard-pressed to argue against having the extra oomph of the GT's 2.5 litre engine. Truly one of the most engaging mainstream compacts available. You can find my Toronto Star coverage of what Honda Canada unveiled at the Canadian International Auto Show in Toronto here. 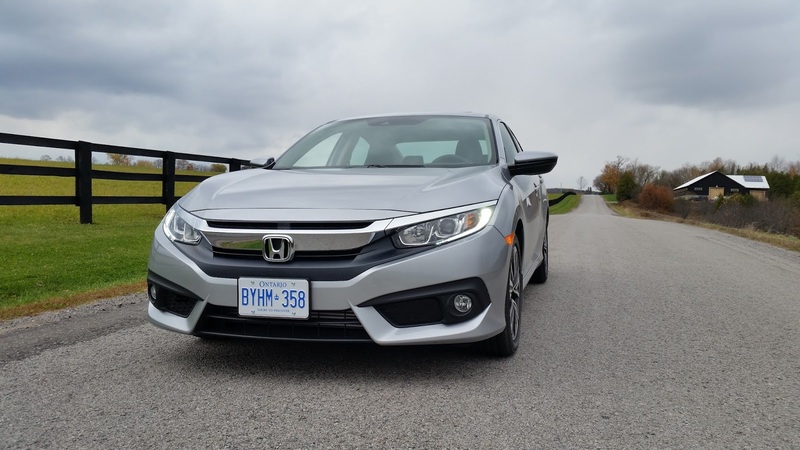 With Honda having just been awarded AJAC's Canadian Car of the Year that morning, Jean-Marc's presentation began with well-deserved kudos to Honda's staff for the winning product. The other big news item was the new Ridgeline, seen above. It will be interesting to see how the combination of the obvious relationship to the Pilot crossover (shared forward sheetmetal and headlights) and far more conventional-looking box (no more odd sail panels between the box wall and rear of the cab) will be received by mid-size truck buyers. Truthfully, the Ridgeline is all the truck many folks shopping the segment need, and it's bound to be better at a lot of the everyday things that people actually use these things for. Let's hope it's better received than the previous one. You can read my Toronto Star coverage of Subaru Canada's presentation at the 2016 Canadian International Auto Show in Toronto here. They really should have used my pictures. As you can imagine, the 2017 Impreza was a large part of the news, with the model's Concept being introduced. The switch from Japanese production to this new generation car being manufactured in the US at Subaru's SIA facility in Lafayette, Indiana was also significant. You can read my Wheels synopsis on the entrants in the Best New SUV/CUV (under $35k) category here. Every time that I cover AJAC's Canadian Car of the Year for the Star, I'm asked to guess which vehicles will win their categories. You'd think that being part of the program's organizing committee would give me some insight. All that I can say is that it's a good thing that I don't have a gambling habit, because I'd have dug myself a pretty big hole by now with the accuracy of my predictions. 2016 Honda Civic. Spoiler Alert - This one won both its Category and Canadian Car of the Year. Deservedly. You can read my take on the best small cars in Canada for the Toronto Star here. A heads up: you'll also be treated to a video advert, followed by a short video of yours truly explaining why we track test mainstream cars. For several years now, the Wheels section at the Star has done a "Best of" guide that loosely follows the category structure of AJAC's Canadian Car of the Year program, but that opens up eligibility to any models on sale for the year in question (Canadian Car of the Year only permits new or substantially updated models for a variety of reasons). These choices are just that - choices - based on no criteria beyond fitting in the assigned segment. Totally personal opinion based on experience. As it turned out, my top pick this year also happened to win its category and, eventually, overall Canadian Car of the Year honours. That vehicle is the redesigned Honda Civic. 2017 Chrysler Pacifica and Pacifica Plug-in Hybrid. You can read my coverage of Fiat Chrysler Automobiles' North American International Auto Show (Detroit) news for the Toronto Star here. FCA's biggest news in Detroit was the unveiling of the firm's next generation minivan. Arguably the creator of what we recognize today as a minivan - as distinct from earlier, typically commercial-based small passenger vans - the company clearly remains committed to what is now a shrinking segment with fewer players. For our market at least, the new Pacifica will be available alongside the existing Dodge Grand Caravan, though possibly only briefly. It is effectively the replacement for the previous Chrysler Town & Country, lone holdout of the ampersand in a model name, and the far better selling of the company's vans in the US market. In spite of the unfortunate name - "Pacifica" was previously worn by a poor-selling, oddly configured large-ish crossover - this new model does have great promise. It will also offer a minivan first - a plug-in hybrid version. Volkswagen Tiguan GTE Active Concept - Our next Tiguan, sort of. You can read my Toronto Star coverage of Volkswagen's news from the North American International Auto Show in Detroit here. With Volkswagen's Diesel Scandal still fresh, Volkswagen's Detroit presentation was heavy on apology, light on news. The Tiguan GTE Active Concept ticks most of the current auto show concept boxes - a hybridized drivetrain, electric-only capability, lots of connectivity. It also happens to be a lightly gussied-up version of the ROW's (Rest Of World's) next-generation Tiguan. The North American model, just like the current Passat, will be slightly larger, and probably have styling differences to suit our tastes. It is also likely to be manufactured on this side of the Atlantic.